Millions of people speak Spanish as their mother tongue. In fact, it is estimated that 400 million people speak Spanish, making it the second largest language used in the free world. Travel to the USA, Canada, Italy, France, or even Australia, and you will find many people who speak Spanish. Keep reading more about the importance of learning Spanish! Locations worldwide where you can learn Spanish: Mexico, Costa Rica, Ecuador, Argentina, Chile, and Spain. We offer different promotions for our Spanish courses in several of our locations, choose yours! Spanish is the primary language of 20 countries worldwide. It is estimated that the combined total number of Spanish speakers is between 470 and 500 million. Spanish is the second most studied language and second language in international communication. Accredited by Instituto Cervantes/The Ministry for Education of Spain. The Secretary of Education of Mexico. Bildungsurlaub accredited in eight German federal states. CENNI: National Language Level Certification by the government of Mexico, only Spanish language school accredited by the government of Mexico. 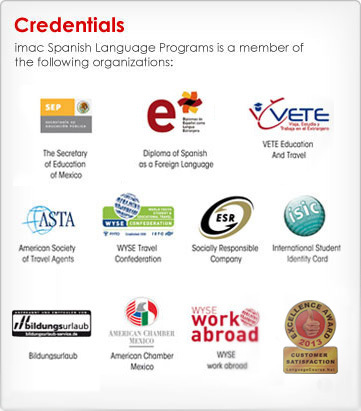 Spanish for Specific Purposes Programs: Business, Medicine, Law, Travelers, Teachers, Tourism, etc. Start your adventure abroad in Guadalajara, Mexico! Click here and find out a map with our location, prices, video testimonials and much more. Learn Spanish in Caribbean paradise! Only 45 minutes away from Cancun, Playa del Carmen offers white sandy beaches, turquoise warm waters, and the opportunity to experience Mexico's Mayan heritage. This former fishing village offers a great environment for learning, and one of the best Spanish Courses in the area. Over the years this city has developed from being a small coastal town into one of Mexico's most important world class resorts. In spite it's growth, Puerto Vallarta has an "old Mexico" feeling, providing you the perfect environment to learn Spanish and practice while enjoying a fine beach holiday. As the "City of Eternal Spring", Cuernavaca allows you the chance to escape, to relax, and to enjoy peace and quiet while learning Spanish, providing you with one of the richest cultural atmospheres in Mexico! With its undulating hills and its narrow cobblestone streets, Cuernavaca is a quaint colonial town reminiscent of older times. You will definitely appreciate its history, extraordinary scenery, art, and marvelous climate! Considered by most to be Mexico’s best city, Oaxaca is a city rich with culture and traditions, recently declared a World Heritage Site by the United Nations due to the preservation of its colonial buildings and its proximity to the stunning archaeological site of Monte Alban. In addition, the city is famous for its wide variety of delicious food, and truly blessed with a spring-like climate! Better know as the cradle of the Mexican Independence, Guanajuato has become one of the favorite cities to visit and study Spanish for people around the world. The city counts with stunning structures that create a peaceful and enjoyable environment to learn Spanish. San Jose is Costa Rica's capital city, and the country's most important point for political and economic activity (though it's population does not exceed 400,000!). Its perfect climate is tropical and mild year round, and you may enjoy many cultural activities at its theaters, museums, and botanical gardens; though you can also dance the night away at its clubs, and practice the country's most popular sport: Soccer! On the Pacific Coast of Costa Rica lies Jacó Beach, keeping our great tradition of Spanish teaching while offering you all the attractions of a seaside city. It is known as the "City of Surf" and offers some of the best surfing in the country. Amidst the tranquility of beautiful tropical gardens you will have the possibility of taking your first steps in Spanish, or of perfecting the language skills that you have already acquired. The green and hospitable town of Coronado (70.000 inhabitants) is located 10km outside of San José, near the southern border of the beautiful Braulio Carrillo National Park, with easy access to the city center of San José by public buses (every 15 minutes). This small town offers a friendly, clean, safe and natural environment, where even female students going out alone will feel comfortable. Ranked among the safest cities in Latin America, with the highest quality of living. Known as the "garden city", Viña del Mar offers perfect Mediterranean weather year round, beautiful beaches perfect for surfing and sun bathing, and numerous parks throughout the city. A perfect place to take your Spanish lessons and improve your Spanish skills. It is also a big supporter for cultural and artistic activities, hosting an annual international music festival. Capital city of Argentina and home of Tango dancing and soccer, Buenos Aires is the most elegant, cosmopolitan, and multifaceted metropolis in Latin America. With a strong European heritage, it is the Mecca for culture lovers through its numerous museums, conference rooms, art galleries, theaters, and world class national and international show performances. Truly guarantees amazement in all its visitors! Due to its central location within the national territory, Córdoba affords easy access to Argentina’s main tourist attractions: the Iguazú Falls, the Patagonia region and the glaciers, the Northern region, and the cities of Buenos Aires and Mendoza, among others. The city of Cordoba is a major destination for those wishing to learn Spanish while traveling around. Capital city of Ecuador and the middle of the world. The Spanish spoken here is clear and accent-free, making it the perfect place to learn Spanish! The city has a very strong cultural heritage reflected in its preserved Historical district, recognized by the United Nations as "Patrimony for mankind". Also recognized as patrimony for mankind by the United Nations, it is the third most important city in Ecuador. Its Historic district has also been preserved, reflected in its plazas, colonial architecture, and cobble stone streets. The city is divided by the "Tomebamba" river and offers its visitors beautiful landscapes and a privileged year round climate, due to its location between the Andes Mountains and highlands. Unlike any other place in the world, the islands are located off the coast of Ecuador. The Galapagos are famous for their unique bio-diversity of endemic species and the studies by Charles Darwin, which lead to his Theory of Evolution and natural selection. Undoubtedly a great place to experience conservation at its peak! Learn Spanish in the heart of the Amazon Jungle, 60 minutes off the city of el Coca canoeing along the Napo River. For the adventure spirited, in the Amazon Jungle you will discover and experience protected reserves, unique bio-diversity, indigenous communities that maintain their culture alive through centuries, and more! If you have only a short time to see as much of Ecuador as possible AND learn Spanish, consider joining the Spanish and Travel. The Spanish School combines adventure activities as biking, visiting waterfalls, hiking along the highlands, visiting local markets, exploring the Amazon Jungle, etc. ; the travelling classroom offers just that and more! Perfect for adventurous first timers in Ecuador and those unsure about the location they would like to visit! This Spanish Language School is based on this Spanish city devoted to culture, and the support of various music and art festivals throughout the year. Home to Spain's most important university, it has also played a very important role in Spanish History. Granada's Alhambra, the stunning city between walls on top of a mountain where the monarchs and Granada's Kingdom of Nazari lived, was declared "Patrimony of mankind" by the United Nations. This beautiful coastal city offers perfect weather, and over 322 days of sun through the year! See the majestic Moorish Medieval fortress rising and dominating the sky line, and Natural Park Mount Mongo. Perfect spot to enjoy fine Mediterranean cuisine, and enjoy a fine beach holiday while learning Spanish! Cosmopolitan and multi-cultured as it is, Barcelona is one of the best cities to visit in all of Spain. Barcelona is located on the Mediterranean, south of the border to France. It is very easily accessed by plane from Europe, or any major airport in the world. The city has a huge number of attractions, including a city centre which still maintains its medieval street plan. Barcelona attracts a huge number of foreign students, as it combines its obvious attractions as a place of outstanding tourist and cultural interest, a friendly, cosmopolitan population and general atmosphere, and Spanish that is spoken with clarity not to be found in other parts of Spain, making it easy to understand as well as, for learners, to imitate. Seville is a quiet city, ideal for walking through its beautiful streets, its gardens, its parks; perfect to enjoy its incredible monuments, the coolness of its thousand year old river and riverbanks. On the other hand, Seville is also a festive city, with festivals that reveal the traditional unique Sevillian character! Famous for its unique atmosphere and the hospitality of its inhabitants, Seville represents the spirit of Andalusian culture. Seville is a city open to the past, living in the present and prepared for the future, a place of meeting, tolerance and sharing. All of this make Seville an attractive first class destination for learning Spanish! Majestic and enchanting, Spain’s capital city home to over 5 million inhabitants and meeting point for over 49 million tourists that come to Spain every year. The city welcomes you as you cross the famous Puerta de Alcala, Madrid’s international symbol of wide-open doors, friendship, and warm heartedness; no-one feels like a foreigner in this city! Madrid is an important gateway to the rest of Spain and neighboring countries such as France, Portugal and North Africa’s Mediterranean coast cities; and a sister to Latin America, hosting an important Latin community. It is the 10th city with the best quality of living known also as La Villa and La Corte, it is Spain’s largest city. Valencia is a modern and exciting city which nevertheless keeps its historical touch. The city is an architectural melting pot, which testifies the cultural mix of the Valencian people, and gives the city an atmosphere that is open to both new cultures and old customs; this makes it the best place to learn Spanish in Spain. Despite its connection to the Costa de Sol, Malaga is not a tourist city. The people you will meet in Malaga are Spaniards, enjoying their beaches, bars and restaurants!With its international airport and modern motorway network Malaga is easy to get to and perfectly located for visiting other cities of Andalucia such as Granada, Seville, Cadiz, and even a weekend escape into Africa! The perfect location to study Spanish and know the country!!! 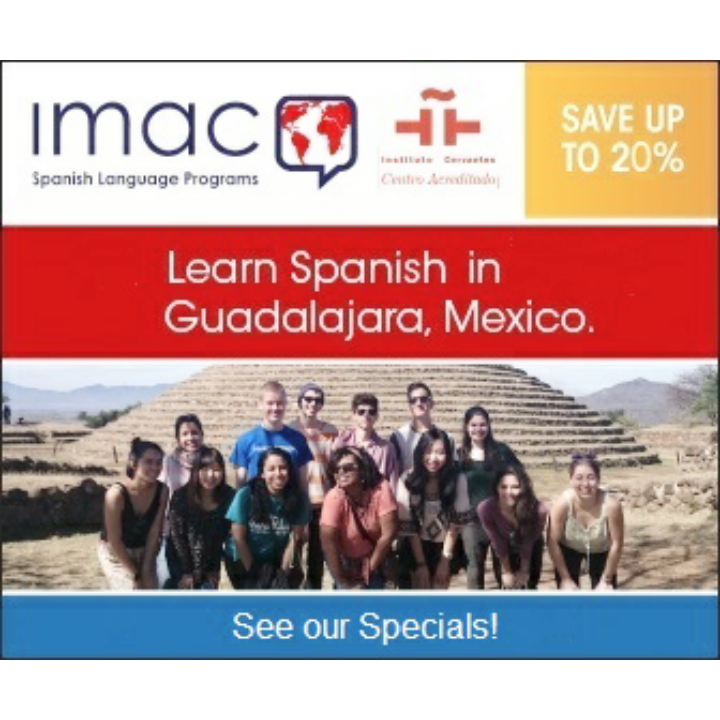 Welcome to the world of IMAC Spanish Language Programs! Click on any link to check out the various sites from videos to our latest Blog. See who's who on Facebook. Explore the maps and view exotic sights on Pics. Have fun! !